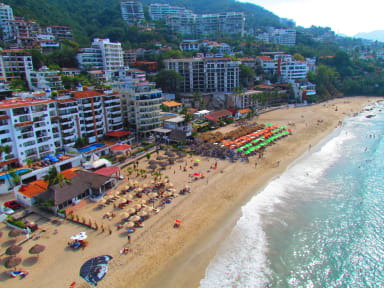 Just half block from the beach, Los Muertos Hostal is a brand new European style hostel with authentic Mexican charm. 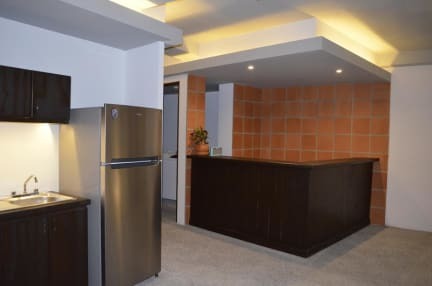 In Los Muertos Hostal, you will find the ideal place to rest in the best location, clean facilities, keep your belongings safe and meet people from all around the world at a very reasonable price. Every room at Los Muertos Hostal features A/C, ceiling fan, free WiFi, cosy bunk beds with safety drawer per bed, private shower, private toilet, and black out curtains. In addition, we have some common areas where the travellers can get together and exchange past experiences and future plans. The reception service is open from 08.00 to midnight. At the time of admission to the hostel, guests have to show an identification document, be at least 18 years old and give the required information to complete the room registration. External non-hosted people are forbidden inside the rooms. Pets are not allowed, but guide dogs are. Staff are allowed to deny access, ask for a guest departure or call the authorities when necessary. In the case that a guest is required to leave the Hostel for breaking any rules, there will be no refund of the unoccupied nights. Guests can´t switch beds or rooms without staff permission, modify the beds arrangement, use extinguishers irresponsibly , deactivate emergency lights or falsely activate of fire alarms. Los Muertos Hostal is a smoking free space and there is no smoking inside the facility. It´s forbidden to store, sell, consume or distribute any type of psychotropic or drug inside the facility. Los Muertos Hostal has several lockers per room. We take no responsiblity for valuable objects. Guests are allowed to use the kitchen and storage for food and drinks. Guests can label products and food. 23:00 hrs. is quiet time. There should be silence, unless the hostel had a scheduled an event after this time. The use of headphones is required. Visits after 22:00 hrs. are forbidden. Room cleaning services begins at 11:00 hrs. Guests inside the room after this time should give access to the cleaning staff. Guests should wash the dishes used in the kitchen in order to keep the facilities clean for all guest. Air conditioning systems will be turned on only at night from 22:00 hrs. to 08:00 hrs. Food and drinks are not allowed inside the rooms. It is forbidden to introduce any type of weapon or dangerous substance that represents any threat to people. Any damage to the facilities, furniture and equipment shall be paid in equivalent to the repair of damage or reposition of the object. Robbery and intentional damage will be immediately reported to authorities.